Since I started with the upstairs in this series of reveals from my Roosevelt Craftsman project, I thought I'd continue the trend by moving into the teen boy's room. Decorating a teen room is probably one of my biggest challenges, not because I can't decide what to do, but almost one hundred percent because of the young client. Teens tend to be very particular and not very trusting. It makes sense, when you think about it. Teens are always right, and they know everything. That said, I've learned that the best strategy for a teen room is to give them some choices, but mostly just to put the room together and go from there. Asking a teen if they prefer this lamp or the other is a recipe either for a shrugged shoulder or comments of vehement dislike. So, knowing that the best option is a complete picture, that's mostly what I did in this space. 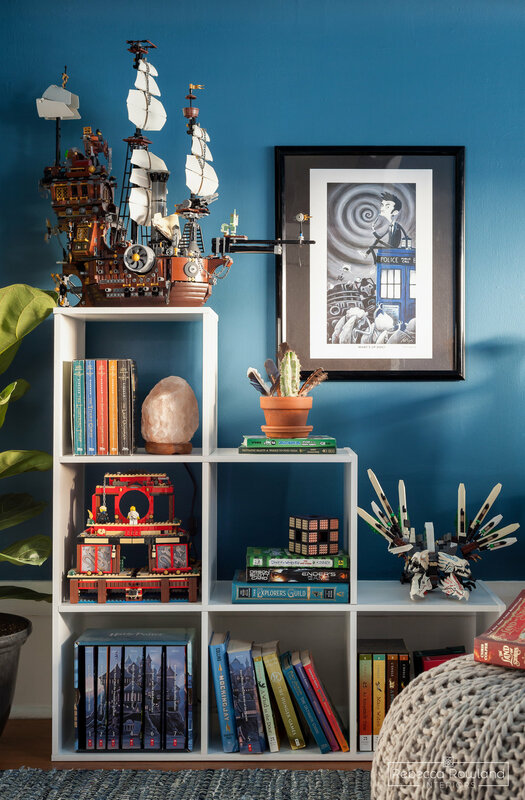 I provided a palette of choices for the blue paint that would go on the wall, took inventory of what he really didn't like, or as I like to ask clients, "what in design are you allergic to," and went from there. This room is another case where I don't have a good "before" picture. I seriously don't even know how that happened. For the life of us, neither my client nor I can find a picture from before we had the room painted, so you'll have to take my word for it that it's a major transformation. Here's the deal, many people, when faced with low walls that curve into the ceiling, will stop the wall color at a place somewhere along that curve and then do a standard white color on the ceiling. Big mistake. Huge. Yes, I'm going all Pretty Woman on you here. What happens, as was the case in the room before I got my hands on it, is that the walls look even shorter and you're calling attention to deficiencies that don't need attention. It's just plain awkward to make a ceiling line where there's not meant to be one. Here's the picture I do have. It's actually a progress shot my client sent me after the walls were painted in Benjamin Moore Lucerne. Two vintage pieces that were going into the space had already been installed as well, due to the urgency of him needing surfaces on which to sleep and work. Weird kid. Kidding. He's actually quite delightful, albeit needy. Kidding again. I feel like I have to tell you I'm kidding just in case, you know? So back to the room, as you can see in the progress shot, the paint is taken all the way up through and onto the ceiling, and there are no weird moments detracting from the overall color application. Except….there is. That darned window. Its low placement and largeness give that wall a kind of hobbit-like appearance. Big, fat hole on a tiny surface. Its low height drags the wall down and there is nothing to lift the eye up. I want that window to be a focal point, since it's the first thing you notice when you walk in, and I want to keep the eye high. Why? So you don't notice teenager laundry strewn all over the floor. That brings me to the big "after" shot - the hero image. My young client liked to sleep with his head at the foot of his bed so he could wake up to a view of the mountains every morning (ever clear morning, that is). That worked well with my planned placement of the bed, which still allowed for a view while also sleeping at the top side of the bed. Win! I don't have a problem putting a headboard in front of a window when it is not a solid surface. I chose to use a vintage brass bed, because of my intended placement in front of the window. The rungs allow light to stream into the room. Using a vintage bed rather than a new one adds a patina and depth to the space you wouldn't otherwise had. Above the window, I placed a curtain rod as far as I could without going into the narrowing portion of the wall and wider than the window and used colorful panels with a creamy base color to provide movement and break up the wall color a little as well. Above the window, I decided to fill the gap with a shelf to display some of the boy's treasures that I found tucked away in his closet. He had some figurines he'd assembled, original art he'd bought with his mown money and other memorabilia, but nowhere to display it. Now it all greets him when he walks into the room. Beside the bed is a handmade stool I used as a side table. Its size works well holding a small lamp and glass of water and doesn't further encumber the window. This young client is also a lover of legos and in a room next to his, I found a collection of models he'd assembled and was loathe to take them apart. I gave him a place to display them along with some other treasures. I love this moment in his room. Along with the pouf, he now has a cozy little nook in which to read one of his well-thumbed volumes. In the other corner of his room where the head of his bed had once been, I placed the vintage desk. Above the desk hangs another original painting by Jesse Link - the vibrant colors work so well in this room. Pro tip - where possible, use original art. It makes the space feel so much more special and you are supporting an artist and helping them not starve. Do you want artists to starve? No? Okay, stop buying your art where you buy your laundry detergent. Just a thought. Not sure how to find art? Look on Etsy, or look at the #[yourcity]artist hashtag in your town. I'm always on #seattleartist looking for new local artists I can draw work from. Also, I love Amy Stone's Affordable Art Act account - because, as she says, "everyone should be able to own art they love." I digressed. I'm really happy with this room, and so were my clients. They thought it was the biggest transformation in the whole house. It's not technically true, but it shows the power of an ideal floor plan, pops of color, original art, and painting that ceiling. Remember, when you've got an awkward moment in your house, there's always a solve for it, whether you hang a shelf to display with treasures or invest in some curtains, you can find the solution. But if not, you can always call on me. I'm here to help in Seattle and beyond!